From there we visit the 7th natural wonder – the majestic Table Mountain. 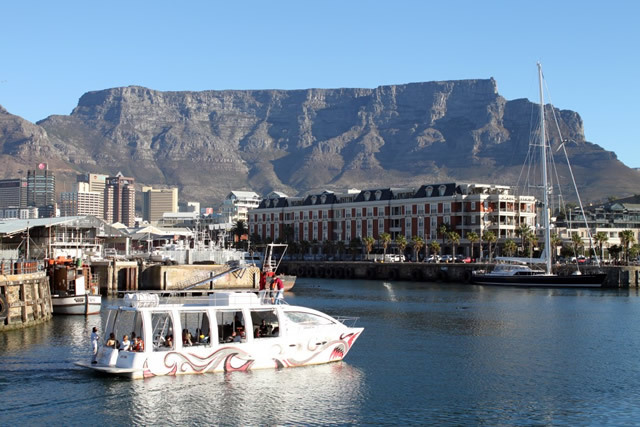 Go up in the 5 minute cable car ride before an incredible walk on the summit where you can enjoy the spectacular views of the Mother City and the surrounding peninsula. 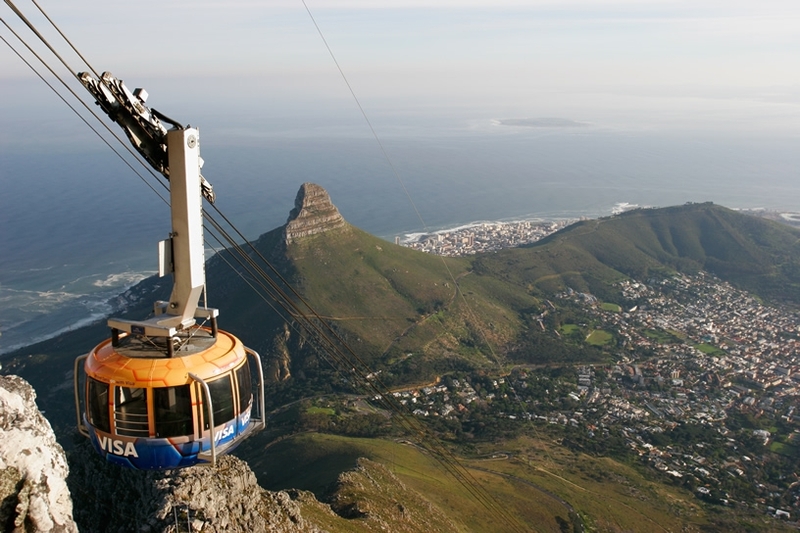 The Table Mountain Aerial Cableway was the solution to the arduous walk and climb to the top. At the upper cable station you will find a restaurant and a curio shop as well as a network of footpaths to explore the table top. 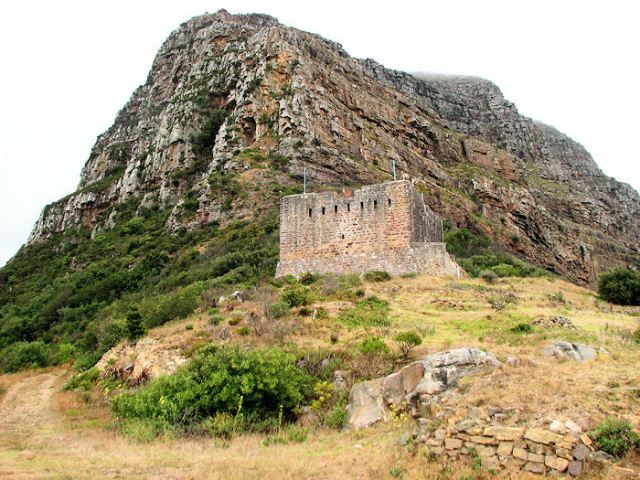 There are plenty of hiking trails from the Camps Bay side of the mountain. You can walk or climb the mountain, or even abseil down it, depending on your expertise and fitness levels. The main feature of Table Mountain is the level plateau approximately three kilometres (2 mi) from side to side, edged by impressive cliffs. The plateau, flanked by Devil's Peak to the east and by Lion's Head to the west, forms a dramatic backdrop to Cape Town. This broad sweep of mountainous heights, together with Signal Hill, forms the natural amphitheatre of the City Bowl and Table Bayharbour. The highest point on Table Mountain is towards the eastern end of the plateau and is marked by Maclear's Beacon, a stone cairn built in 1865 by Sir Thomas Maclear for trigonometrical survey. It is 1,086 metres (3,563 ft) above sea level, and about 19 metres (62 ft) higher than the cable station at the western end of the plateau. 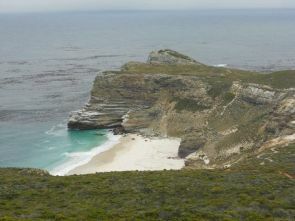 The cliffs of the main plateau are split by Platteklip Gorge ("Flat Stone Gorge"), which provides an easy and direct ascent to the summit and was the route taken by António de Saldanha on the first recorded ascent of the mountain in 1503. The flat top of the mountain is often covered by orographic clouds, formed when a south-easterly wind is directed up the mountain's slopes into colder air, where the moisture condenses to form the so-called "table cloth" of cloud. Legend attributes this phenomenon to a smoking contest between the Devil and a local piratecalled Van Hunks. When the table cloth is seen, it symbolizes the contest. 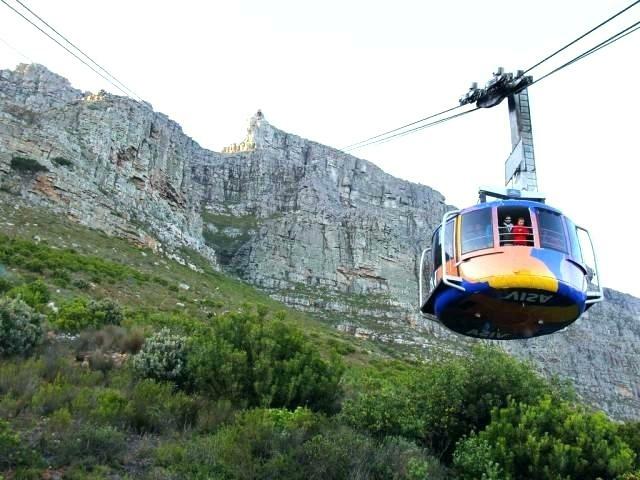 The Table Mountain Aerial Cableway takes passengers from the lower cable station on Tafelberg Road, about 302 metres (991 ft) above sea level, to the plateau at the top of the mountain, at 1,067 metres (3,501 ft). 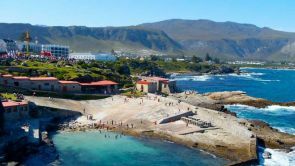 The upper cable station offers views overlooking Cape Town, Table Bay, Lion's Head and Robben Island to the north, and the Atlantic& seaboard to the west and south. 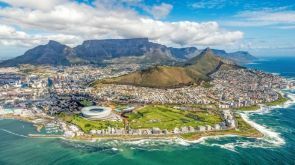 The original construction was awarded in 1926 to the former world-renowned cable way company Adolf Bleichert & Co. of Leipzig, Germany, taking more than two years to build the Table Mountain Aerial Cableway, due to infrastructural works, official opening was on October 4, 1929. The Table Mountain Aerial Cableway has been refurbished three times since its first inauguration in 1929. The first refurbishment occurred in 1958, the second in 1974, whereas the third, latest and most important reconstruction has been started in 1996, which began operation in 1997 and included a "Rotair" panorama gondola manufactured by the Swiss company Garaventa AG - CWA (Doppelmayr Garaventa Group). Many improvements have been introduced since 1929, with new and bigger gondolas that increased capacity from 20 up to 65 passengers per gondola. However, both the valley and mountain station buildings are original, even they have been extensively upgraded. The new cable cars give a faster journey to the summit, and rotate through 360 degrees during the ascent or descent, giving a panoramic view over the city. Hiking on Table Mountain is popular amongst locals and tourists, and a number of trails of varying difficulty are available. Because of the steep cliffs around the summit, direct ascents from the city side are limited. 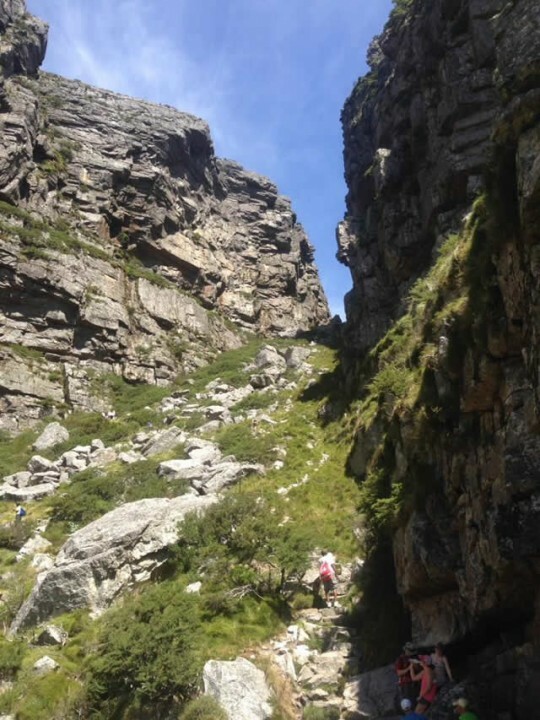 Platteklip Gorge, a prominent gorge up the centre of the main table, is a popular and straightforward direct ascent to the summit. Par for the course is about 2.5 hours but is done between 1–3 hours depending on one's fitness level. 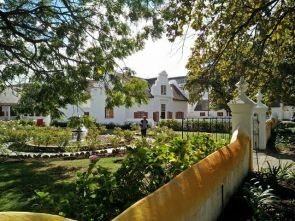 This route is very hot in summer, as it is located on the north facing slope of the mountain, with almost no shade along the 600 m climb from Tafelberg Road to the Table Mountain plateau. The slopes of Table Mountain have many jeep tracks that allow mountain biking. The route to the Block House is a popular route for bike riding. Plum Pudding Hill is the name of a very steep jeep track. Bike riders should follow the directional signs on display for mountain bike riders.